‘It’s pretty simple,’ tweets a Remain voter, simplistically, before going on to accuse Leavers of expecting life to be simple. Harris refers to an ugly and fatuous Venn diagram retweeted by Ben Goldacre (which is painfully ironic, given that Goldacre has made an entire career out of challenging lazy thinking, dodgy statistics and poorly reasoned claims). So let’s do a mental Venn diagram. Let’s start with a circle for Leave Voters and a circle for Remain voters. This is straightforward: the two circles are separate because you can’t do both. If we were to add a circle for racists, I fully concede that it would overlap a lot more with the ‘Leave’ circle than with the ‘Remain’ one, because disentangling oneself from foreigners is, on the whole, something that would appeal to racists. There is no evidence to suggest that the ‘racist’ circle encompasses all or most of the 17m leave voters, or that some racists didn’t vote remain -after all, the idea of a powerful union of the predominantly white nations of Europe is not without fascist resonances- but yes, probably most racists voted Leave, just as most Islamist terrorists are probably practicing Muslims, so feel free to put a smaller ‘racist’ circle on the diagram that has a largish overlap with the ‘leave’ circle and a smaller overlap with the ‘remain’ circle. Just remember that to conclude from that that all leave voters are racists is as lazy and unfounded as saying that all Muslims are terrorists. But how about a circle representing voters who are less well off and more economically insecure? The evidence suggests that a larger part of this ‘left behind’ circle overlaps with the ‘leave’ circle, than overlaps with the ‘remain’ circle. (Of course a part of it overlaps with neither, because a lot of people didn’t vote at all). On the other hand, a circle representing relatively prosperous voters -the ‘doing alright’ circle- overlaps more with the ‘remain’ circle, rather than the ‘leave’ one. Yes, but we would say that wouldn’t we? It’s more comfortable for us than, say admitting that we voted for a status quo that has looked after us pretty well, or admitting that many leave voters may have voted the way they did because they were fed up with a status quo that (under Tories and Labour alike) hadn’t served them particularly well at all. It’s certainly more comfortable than admitting that a lot of us didn’t show much interest in whether they were doing well or not. All of which is not to say that there is no such thing as economic expertise, or that experts are a waste of time, but rather to make the point that even professional economists are a very long way from certainty, and the rest of us form our views not on the basis of our own detailed understanding of how the economy really works, but on who we choose to trust. In that respect, I suggest, remainers are not so different to leavers as they may like to think. And I’d also suggest that ‘left behind’ folk would not be thinking in a wholly irrational way if they declined to believe experts who told them that the continuation of the status quo was in their interests. What I keep coming back to is that no one wins elections by insulting the majority of the electorate. Politics (as I tried to portray in America City and Mother of Eden) is about doing deals. It’s about different groups in society, who may not have all that much in common, nevertheless entering into alliances with one or another. If you lose an election it makes no sense at all to blame the voters who didn’t support you, because you need to win at least some of them over to your side. The side that lost is the side that failed, the side that was trusted the least. It should be looking at itself to find out what it was doing wrong and what it could do differently, not casting around for scapegoats. In its efforts to be truly scientific, the academic discipline of psychology (which I once studied) relies very heavily on the controlled experiment. There are good reasons for this. As with randomised drug trials, it’s a way (among other things) of elimating the biases, preconceptions and prejudices which inevitably creep in with a more subjective approach. But I wish that psychologists (and indeed scientists more generally) would acknowledge that the methodological self-discipline they impose on themselves does mean that many important and even fundamental questions are simply left outside of their purview. Often, I’ve found, that, rather than admit that their approach has limitations, scientists will simply deny the validity of questions they can’t answer. You might say that these questions are simply unanswerable: any explanation would involve postulating some previously existing thing, whose existence would then in itself require explanation. But that doesn’t alter the fact that they are valid questions. Their very unanswerability is, I would say, a profoundly important aspect of the human condition which ought to occasion some humility about the limitations of scientific understanding. Frontiers may be pushed back, but at the core of everything there is always mystery. To deny that, is to deny our own experience. Incidentally cosmologists are talking these days about the time before the Big Bang. It seems that, now that there are interesting ideas to explore about the multiverse and bubble universes, the question is no longer meaningless! One phenomenon which is extremely resistant to the experimental method is dreaming, since our dreams are invisible to anyone but ourselves and our dreaming selves are never in a position to make notes or measurements (or at any rate, not notes or measurements that will still exist when we wake.) And I’ve come across experimental psychologists being very dismissive about the importance of dreams. Again, it seems to me, this is an instance of being reluctant to own up to limitations: ‘We are the experts, we don’t know how to answer these questions, so therefore they can’t be important questions.’ Not really ‘scientific’ behaviour, so much the behaviour of a jealous priesthood. After all, if we only took seriously the things and processes whose existence could be demontrated by rigorous experiment, we’d have to jettison most of the contents of our lives, and surrender judgements that we’re perfectly capable of making to professionals to make for us on the basis of a much narrower range of data than we ourselves would naturally deploy. I once went to a doctor asking for help managing some symptoms which I knew were the result of anxiety. (The cause of it was no mystery: there was a very big thing I was worrying about). He had me fill in a multiple choice questionnaire, totted up the scores and informed me that I was suffering from anxiety. But back to dreams. You only have to consider you own dreams to see the subtlety and complexity of what is going on in them. To give one example: recently both we and our neighbours had building work going on at the same time in our adjoining terraced houses. In the case of the neighbours, this work was so extensive that they had to move out completely for the duration. During this period I had a dream that our builders had accidentally knocked a whole through our shared wall, so that I could see right through into their living room. In my dream, my neighbour Simon came to have a look at the building work, and I greeted him through the hole in the wall, expecting him to be as amused as I was by this tempororary problem. In fact, though, he was angry. It was unacceptable, he said, that our builders should broach their boundary in this way. One part of my mind, in other words, was generating, not just random thoughts and images, not just random firings of neurons, but a world and characters, as in a story, with which another part of my mind, the story’s protagonist, could interact as if they were real places and people. That’s a fairly complex thing going on there. And, what’s more, that same ‘other’ part of me -the part that, in my dreams, presents itself not as me but as the world- doesn’t just generate a setting and characters, but also symbols and metaphors. For instance, I once dreamed I saw a blind man begging in the street, completely unaware that right behind him was a broken cash machine pouring out bank notes. Whatever part of me it is that generates the dream world and invents plausible motives for its characters, had here (as on many other occasions) constructed a fairly decent metaphor, in this case for someone who is very unhappy but failing to recognise the opportunites available: my own situation at the time, as I realised when I woke up. This is not random firings of neurons! This is intelligent story-telling. It shows how dreams include the same basic elements as stories told in waking life, even though we are supposedly ‘unconscious’ when we construct them. But then, at its core, all story telling is unconscious: you reach into yourself for something and, if you’re lucky, eventually something pops up from…well… somewhere. Another of those unanswerable questions about how something emerges from nothing. And dreams aren’t even confined to humans. Anyone familiar with dogs knows that that they can be seen running, or barking, or whining in distress in their sleep. Story-telling seems to be hardwired into us, running so deep that it predates the evolution of human beings. What is the content of animals’ dreams? What does a squirrel dream of? How about a lizard, or a fish? Impossible to answer, but still perfectly reasonable questions. Possibly the most cheerful piece of music I know of. You definitely need to watch this until the two soloists do their chicken dance. 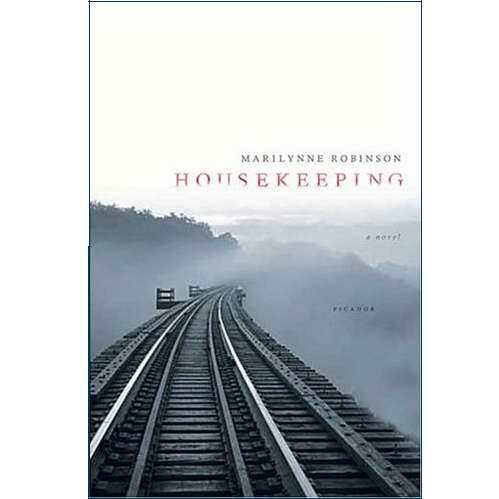 Housekeeping, by Marilynne Robinson (published 2004)..
Two sisters grow up in a small town in Idaho beside the large lake that claimed the lives of both their grandfather and their mother, and the railway bridge that spans it. Their grandmother looks after them until she too dies, and then two great-aunts who are more accustomed to shabby-genteel life in a hotel room than managing a household with children, and then finally their odd, solitary, distracted aunt Sylvie, who has lived her life as a transient, picking up work here and there, riding in boxcars, gathering odd little yarns from passing acquaintances. The sisters and their aunt live a deeply eccentric life, largely cut off from the rest of the community. One of the sisters (Lucille) eventually breaks free of this, the other (Ruth, who is also the narrator) does not. The town itself seemed a negligible thing from such a distance. Were it not for the clutter on the shore, the flames and the tremulous pillars of heat that stood above the barrels, and of course the skaters who swooped and sailed and made bright, brave sounds, it would have been possible not to notice the town at all. The mountains that stood up behind it were covered with snow and hidden in the white sky, and the lake was sealed and hidden, yet their eclipse had not made the town more prominent. Indeed, where we were we could feel the reach of the lake far behind us, and far beyond us on either side, in a spacious silence that seemed to ring like glass. The shore drifted in a long, slow curve, outward to a point, beyond which three step islands of diminishing size continued the sweep of the land toward the depths of the lake, tentatively, like an ellipsis. The point was high and stony, crested with fir trees. At its foot a narrow margin of brown sand abstracted its crude shape into one pure curve of calligraphic delicacy, sweeping, again, toward the lake. “Let me see that,” Lucille said. She took the book by each end of its spine and shook it. Scores of flowers and petals fell and drifted from between the pages. Lucille kept shaking until nothing more came, and then she handed the dictionary back to me. “Pinking sheers,” she said. “What are they good for?” This was not a real question, of course. Lucille lowered her coppery brows and peered at me boldly, as if to say, It is not crime to harden my heart against pansies that have smothered in darkness for forty years. A theme that runs through the book is the paradoxical nature of loss, the way that something or someone lost can be a much bigger matter than the actual presence of that something or someone would ever have been. Lucille is fighting this when she hardens her heart against the flowers. And it is her that manages to escape the odd solitary menage she shares with her aunt and sister. …if she had simply bought us home again to the high frame apartment building with the scaffolding of stairs, I would not remember her that way. Her eccentricities might have irked and embarassed us when we grew older… We would have laughed together at our strangely solitary childhood, in light of which our failings would seem inevitable, and all our attainments miraculous. Then we would telephone her out of guilt and nostalgia, and laugh bitterly afterward because she asked us nothing, and told us nothing, and fell silent from time to time, and was glad to get off the phone. Ruth’s degree of insight stretches credulity a little here. One accepts the literariness and poetry of Ruth’s voice as a device, but it is hard to believe that this drifting isolate, looking in at the world from outside, could really acquire any kind of understanding of the bitter, guilty dutifulness of the middle-aged grownup children of a not-very-satisfactory mother. But never mind. What I got very powerfully from this book -and I keep coming back to it in my mind- is a demonstration of how absence becomes addictive. Look at the photo on the cover. How much more myterious and alluring is the part of the railway track in the distance that is disappearing into the mist, than the part in the foreground you can see perfectly clearly. Dwell too much and too long on absence, and mere presence will never be enough. Myself, I see this happening around me all the time. I don’t mean by this – and I don’t think Frank is saying this either- that the professional class is acting in its own interests knowngly and cynically. We human beings have a need to see ourselves as ‘the good guys’, and we rationalise our self-interest in various ways as being in the common good. What I see is liberal professional people telling each other, sometimes pretty stridently, that they are the real left, the real good guys (being as they are against sexism, racism, homophobia, xenophobia etc), asserting that their view of how the world should be run is simply correct (because they, after all, are the class of experts), and becoming increasingly hostile to the elements of their own working class that no longer accepts their authority. Like all powerful classes, they (and really I should say we because it is my own class I am talking about!) believe themselves to be both entitled and virtuous. One of the great things about being a highly educated elite which is against sexism, homophobia etc etc is that you can be pretty certain that the less educated, less intellectual part of the population will tend to subscribe to more old fashioned views than you do on gender, sexuality and so on, thereby making it rather easy for you (in spite of your privileged position) to claim the moral high ground. You just have to keep class off the agenda. The areas in which the left have mad the most significant progress -gay rights, inclusion of women in higher education, the end of de jure racial discrimination- are the battles it has fought for making the meritocracy more meritocratic. The areas in which it has suffered its worst defeats – collective action to provide universal public goods, mitigating rising income inequality- are those that fall outside the meritocracy’s purview. The trouble with meritocracy, it seems to me, even if such a thing could ever be achieved (which is dubious given that successful meritocrats can easily ensure that their children get a head start in the supposedly meritocratic race), is that it has nothing to offer to people who are not especially talented or skilled: and after all, half of the population is by definition of average or below average ability. And this is the trouble even with the idea of meritocracy as a desirable political goal. A meritocratic culture is one that celebrates high achievers, that fetishises exeptional ability and exceptional attainment (Frank describes this very persuasively), and has no interest in those who are merely ordinary. 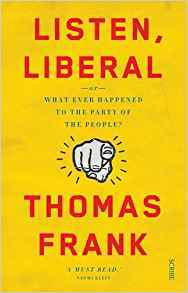 *Frank doesn’t discuss the British Labour Party at all, but its own transition is, in a way, even more striking, given that the much older Democratic Party has represented all kinds of interests over the years (including those of slaveowners and segregationists) but the Labour Party’s very name reflects its origins as a party specifically created to ensure that the interests of the working class were represented in Parliament. A bit random, but it’s something I’ve just been listening to and I thought I’d share it. This lovely aria is from Gluck’s Orfeo ed Euridice. Orpheus is a poet and musician whose music is so beautiful that even stones are enchanted by it. When his beloved Eurydice is killed by snakes, he travels to the underworld to try and win her back. Even the hearts of the rulers of the underworld are softened by his sweet music, and they agree she can return to life on the one condition that he doesn’t look at her, even once, until they have emerged again into the world of the living. In this aria, after various travails, Orpheus finds himself in the Elysian fields. ‘How pure the sky,’ he sings, ‘how bright the sun…’ But none of this can make him happy until he has Eurydice back again. At the very end of the aria, the chorus announces the arrival of Eurydice. Heart-stopping moment! To be in her presence again, when he thought he’d lost her forever and yet be forbidden to look at her, or even to explain to her why he must constantly turn away his face. It fascinates me the way old stories from different places tend to echo one other. No doubt this is sometimes because a story from one culture is heard and taken up by people from another, like the story of St Josaphat. But I’m sure it also happens because certain stories reflect deep structures in the human mind which are universal, and perhaps even hardwired into our brains. I think of the biblical story of Lot’s Wife, who would be turned to a pillar of salt if she looked back at the city of Sodom. But a much stronger resonance is with the Norse story of Balder, who like Orpheus was capable of stirring the hearts even of animals and stones. In the Balder story it is Balder himself who dies and his mother who sends a messenger down into the underworld to beg for his return. As in the Greek story, the ruler of the underworld grants the request on one condition (albeit a different one), and as in the Greek story (though not in the opera! ), the condition is almost met but not quite, and the beloved one is lost forever. ‘Semley’s Necklace’ draws on the Norse myth of the Brisingamen necklace, which belonged to the goddess Freyja (itself a favourite of mine). But Le Guin transposes it to an interplanetary setting and gives it an entirely science fictional twist based on the extreme time dilation that is predicted by the theory of relativity when a starship travels at near light speed. Although she herself comes from an aristocratic background, Semley feels inadequate by comparison with her husband’s people, who are wealthier than her own, and sets out to recover an heirloom that belonged to her own family and will, she believes, put things on a more equal footing. She succeeds in her mission, but tragically fails to understand the implications when told she can reach it in a journey that will only last a single long night. The story is very human, genuinely tragic, and at the same time utterly science fictional in the best possible way, melding its very different elements perfectly. And the plot, the structure, the pacing: well, it simply doesn’t get any better. As to ‘The Ones who Walk Away from Omelas’: it’s sometimes said (and I agree) that, in SF, the world functions as an additional character, but in this story, the world is the main character with the only other real character being the narrator. There is no dialogue, and no one is introduced by name. The story is simply the description of Omelas, a wonderful city, a beautiful and tranquil place, which is introduced to us as its citizens are celebrating the first day of summer. Indeed the narrator, in a way that reminds me of a move made by Jane Austen once or twice, at one point invites the reader to add details of their own to make the world as much to their liking as possible. Of course, it does feel too good to be true. The narrator acknowledges this but then adds a devasting twist which suddenly makes Omelas seem all too real. It’s an extraordinarily original and very disturbing piece of writing. 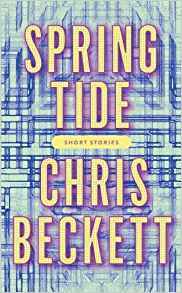 Spring Tide, my new story collection, is out today, both as an ebook and as a beautiful little hardback. I feel I know the physical qualities of those hardbacks pretty well since, in a marathan session at a huge book distribution centre in Grantham (see below), I signed every single one of the current batch, in the company of Kate Straker from Corvus who was meanwhile applying the ‘signed by the author’ stickers. We had quite a cottage industry going there for a couple of hours. 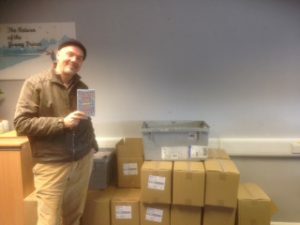 Me and the boxes of books waiting to be signed at Grantham Book Services.